We at Rattan Enterprises manufacture Nutsche Filter Bags and Sheets for all kinds of Nutsche Filters. 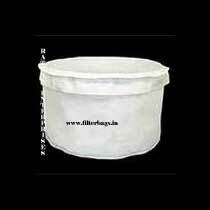 The agitated Nutsche Filter Bags consist of a cylindrical shell with top dished and welded flat bottom. The base plate is stiffened by supports welded under the base plate. The base plate is having arrangement of bolting bar to hold the filter cloth. Suitable support mesh is provided under filter cloth to facilitate the flow of the filtrate.